The group working to recall Senate Republican Leader Scott Fitzgerald (R-Juneau) says enough signatures have been collected. Recall organizer Lori Compas says volunteers have surpassed than 16,742 signatures that are required to trigger a recall. The group is not releasing an official total though until the petition is turned in next Tuesday. Fitzgerald is one of four Republican Senators who are currently targeted by a recall because of their votes last year in favor of Governor Walker’s changes to the collective bargaining of public employee unions. Over the summer, six GOP Senators faced recalls. Other Senators were not eligible to be recalled until November, because they were less than a year into their current term in office. The Senator did not return a request for a comment on the announcement, although he did file a complaint Thursday with the state Government Accountability Board that alleges the recall committee was being given an extra day to collect signatures. Compas does not believe that will impact the outcome, calling it “an attempt to silence the thousands and thousands of people” who signed petitions. The petition against Fitzgerald, along with those against three other Senate Republicans, the governor and the lieutenant governor, are expected to be turned in Tuesday to the state Government Accountability Board. If a recall attempt against Governor Scott Walker succeeds, a state senator plans to run against him. Cullen says running for governor may be his best chance to make a difference. He says Wisconsin has become an “angrily divided state,” which makes it hard make any progress. Cullen was one of the 14 Democratic senators who left the state last spring to block passage of a bill stripping away the collective bargaining powers of most state employees. He maintains that was the right thing to do in order to slow the bill down and help the public become aware of what it included. Cullen says he has no regrets about going. Recall organizers have until January to collect the over 540,000 signatures needed to trigger an election. Audio courtesy of WCLO radio. The head of the largest state employees union says the governor is putting unconstitutional restrictions on state the rights of state workers to collect recall petition signatures. A memo sent to state employees this week outlines state laws against them engaging in political activities while on the job, which includes circulating recall petitions on state property. State Employee Union director Marty Beil says those restrictions are unconstitutional because they infringe on their right to petition the government. Beil says the courts have consistently come down on the side of those exercising their rights, saying employers can only apply a narrow standard and not use a “broad brush” when developing policies. Beil says it would also prevent state workers from helping residents of state facilities, such as the veterans home in King, access recall petitions if they want to sign one. Beil sent a letter to DOA Secretary Mike Huebsch Wednesday asking for changes to the policy. If they are not made, he says they will consider legal action. Just two weeks in to the effort to recall the governor from office, organizers are more than half way there. 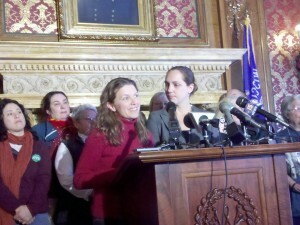 Organizers of the effort to recall Governor Scott Walker and Lt. Governor Rebecca Kleefisch say they have now gathered over 300,000 signatures towards their goal. United Wisconsin executive director Meagan Mahaffey says those signatures were collected in just the first 12 days. United Wisconsin launched its recall effort on November 15th, collecting more than 105,000 signatures in the first week alone. They have until January 17th to collect the 540,208 signatures needed to trigger a recall election. Organizers of a statewide effort to recall Governor Scott Walker from office say the movement is off to a strong start. As of Friday, the last time figures were made available, United Wisconsin executive director Meagan Mahaffey says over 105,000 signatures have been collected. Mahaffey says they feel good about the progress made so far. Tens of thousands rallied on the Capitol Square over the weekend in support of the effort, which needs to gather over 540,000 signatures by mid-January. Mahaffey says most of the volunteers gathering signatures have been well received, although she is concerned about reports of threatening behavior some have faced. She says organizers want to know about those incidents and the victims are encouraged to contact local police. It is a felony to destroy or deface a recall petition. Meanwhile, Governor Scott Walker says his attention remains on a goal of helping the private sector create 250,000 new jobs by 2014. The governor has spent much of the last week traveling around the state to speak at press conferences hosted by businesses announcing expansion plans. In addition to Governor Walker, several Republican state Senators are the target of recalls. Four committees filed papers Tuesday with the Government Accountability Board to launch recall efforts against Senate Republicans. The Senators targeted are Pam Galloway of Wausau, Van Wanggaard of Racine, Terry Moulton of Chippewa Falls, and Majority Leader Scott Fitzgerald of Juneau. In the next 60 days, the committees will need to collect 16,742 valid signatures to recall Fitzgerald, 15,647 for Galloway, 14,353 for Wanggaard, and 14,958 to recall Moulton. The signatures must come from within the lawmakers’ districts. The effort comes just months after recall elections were held against nine members of the state Senate. Those targeted this time around were not eligible for recall then because they had not yet served a year of their current term in office. As a statewide recall effort gets underway today, Governor Scott Walker says he plans to continue working on his goal of helping the state create 250,000 jobs during his first term in office. Opponents of the governor filed paperwork this morning to launch a statewide recall effort. Organizers will have 60 days to collect the over 540,000 signatures needed to recall Walker. Walker says those asked to sign a petition should also consider the impact a second round of recall elections will have on the state, following recalls in the state Senate over the summer. He believes many people do not want to see another election cycle taking the focus away from job creation, along with the millions of dollars that will be spent on political advertising. However, Walker admits there are still many people committed to recalling him from office and reversing the course of the last election. He says that will not take his focus off of the promises he campaigned on and he will continue doing the work he was elected to do. Groups hoping to recall Governor Scott Walker from office will be able to seek out petition signatures online. However, action by the Government Accountability Board on Wednesday is meant to make it clear that they will not allow groups to just print out petitions using databases. GAB director Kevin Kennedy says the policy allows recall petitions to be printed out and signed by a single person, but only the person signing the petition can add in information like the name and address. The clarification comes after Republican lawmakers raised concerns about mass mailings of recall petitions that could be generated by using voter databases. Kennedy admits is a tough issue to address, but people who suspect that has taken place will be able to file a complaint with the elections agency. The issue was brought to the GAB by at least two people working on online petition forms for an upcoming recall attempt targeting the governor. Mark Balwinski of Racine has been working with United Wisconsin to design online forms. He says the policy will make it easier for disabled voters to fill out petitions from home and will also move along their efforts during the 60 days recall organizers will have to collect signatures. The recall effort against Walker is expected to launch on November 15th. The GAB policy does not allow voters to fill out and submit recall petitions online. They will still need to be printed out, filled in, and then mailed to the recall campaign. A Muskego man has filed the first recall effort against Governor Scott Walker. However, Democrats charge it’s actually a ploy to help Walker defend himself from a larger recall effort later this month. David Brandt of Muskego registered the group “Close Friends to Recall Walker” with the Government Accountability Board on Friday, starting a 60 day period to collect the over 540,000 signatures that will be needed to trigger a recall election against Walker. 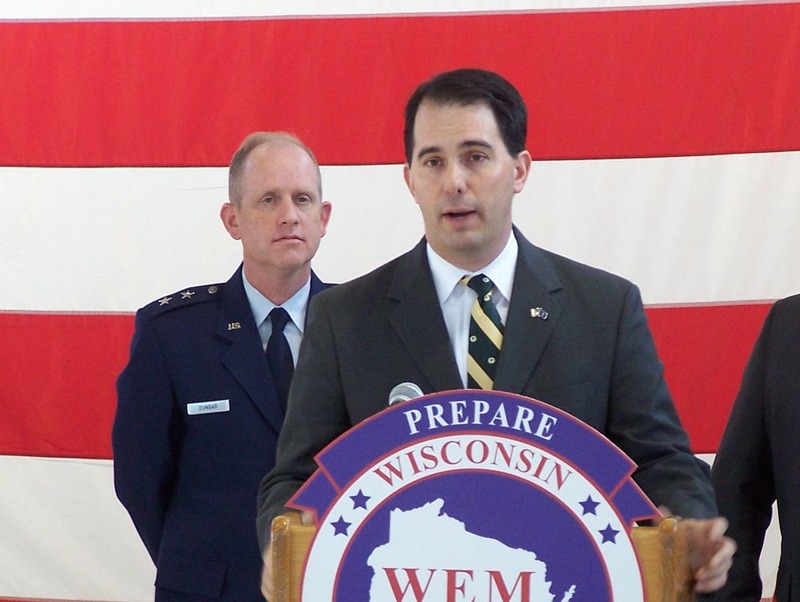 Democratic Party of Wisconsin spokesman Graeme Zielinski says their databases indicate Brandt is actually a Waukesha County Republican, and Friday’s filing is only meant to allow Governor Walker to start raising unlimited campaign funds as soon as possible. Zielinski says the early filing was expected and it will not deter their plans to recall Walker.